CAMBRIDGE (Apr 6, 2016) – Is Zika an instance where the cure is worse than the disease? In the absence of a smoking gun, the CDC yesterday issued a paper arguing that the Zika virus is behind an outbreak of microcephaly among newborns in Brazil. However, new questions have been raised about an alternative cause. Physicians in Argentina and Brazil have warned that the birth defects might instead be caused by pre-natal exposure to the larvicide pyriproxyfen, which has been used to control the breeding of mosquitos since late 2014, just prior to the spread of Zika. These efforts represented the first time pyriproxyfen was added to a nation’s supply of drinking water. In a new report researchers at the New England Complex Systems Institute (NECSI) and Duke University found they were right to be worried. Their findings indicate pyriproxyfen may interfere with human brain development as well, calling into question whether Zika is really the culprit behind Brazil’s outbreak of microcephaly, and raising fears that increasingly aggressive efforts to halt the spread of the mosquitos carrying the Zika virus might only make the outbreak worse. In the paper, they call for more research, and for the phasing out of pyriproxyfen in mosquito control efforts. Pyriproxyfen acts as a larvicide by interfering with the development of mosquito larvae. It may unintentionally do the same in humans. Its structure mimics the role of juvenile hormone, which has been shown to correspond in mammals to a number of molecules including retinoic acid, a metabolite of vitamin A, with which it has cross-reactivity. The application of retinoic acid during development has been shown to cause microcephaly. Methoprene, another juvenile hormone analog that was approved as an insecticide based upon tests performed in the 1970s, has also been shown to bind to the mammalian retinoid X receptor, and to cause developmental disorders in mammals. Isotretinoin is another example of a retinoid causing microcephaly in human babies via maternal exposure and activation of the retinoid X receptor in developing fetuses. While the Zika virus has spread throughout the Americas, dramatic numbers of microcephaly cases have not been reported outside of Brazil. French Polynesia did see an increase in developmental brain abnormalities following its own Zika outbreak, but that country’s comparatively smaller population reported only a few cases in total. Given the timing of Zika’s spread, the number of cases of microcephaly in other South American countries should continue to rise in the coming months. Colombia has reported 34 microcephalic infants in the past few months, but this number is consistent with the background rate of 140 per year. In Brazil, only a fraction of the cases of microcephaly have been directly connected with Zika infections. If these numbers do not continue to rise, another factor unique to Brazil might be to blame, such as the use of pyriproxyfen in drinking water. Pyriproxyfen has been used in several countries for years, sprayed on crops and administered to pets as flea control, but Brazil is the only country to widely apply the larvicide to drinking water. While pyriproxyfen is approved for this use, NECSI questions the conclusiveness of existing toxicology studies. Philippe Grandjean, a highly regarded neurodevelopmental toxicologist affiliated with the Harvard School of Public Health, says, “Few pesticides have been properly tested for developmental neurotoxicity. This is unfortunate as pesticides are suspected of causing a silent pandemic of neurotoxicity. In this case the absence of proper toxicological data confuses the search for causes of the reported surge in microcephaly.” While Sumitomo, the manufacturer of pyriproxyfen, claims there is no reason to be concerned, in reviewing their tests Grandjean notes that “an animal test shows possible link to teratogenic effects and smaller skull,” which is a way microcephaly is detected. 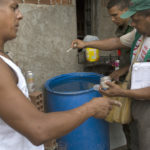 While the consensus of public health officials implicates the Zika virus, the researchers believe Brazil should stop using pyriproxyfen in mosquito control until the source of Brazil’s microcephaly cases can be identified with certainty. Whether or not Zika is truly responsible for microcephaly, the virus does cause other neurological problems and the mosquitoes carrying it also spread other harmful diseases. Thus, reducing mosquito populations is still important to public health. In the interest of precaution, NECSI recommends mosquito control efforts replace pyriproxyfen with other pesticides such as Bacillus thuringiensis (Bt) toxin, a product with a longer record of use in drinking water. NECSI has also recommended community based use of lethal ovitraps — putting out small containers with water that mosquitoes can lay their eggs in, and then destroying the eggs. This approach has been piloted successfully in Brazil but awaits wider implementation. Dan Evans, Fred Nijhout, Raphael Parens, Alfredo J. Morales, Yaneer Bar-Yam, A possible link between pyriproxyfen and microcephaly, New England Complex Systems Institute (2016).